This simple instant vada recipe is an absolute crowd-pleasing healthy snack. A perfect starter for a small party. Apart from making the traditional vada recipes, the possibilities of making great dishes or snacks out of bread pieces are immense. This tempting and tasty bread snack will comes under kids snack ideas. I had posted many simple snack recipes with bread / snack for kids / snack ideas and you all enjoyed those healthy snack recipes recipes well. So here is yet another easy healthy snack to make for kids and our family. Bread recipes for a snack are kids' favorite and try to pack those healthy snacks in their snack box. Do check out my quick snack recipes with bread and enjoy. Trim the edges of bread slices and coarsely crumble it with your hand and put them in a bowl. To this add chopped onion, chopped green chilies, cumin seeds, rice flour, baking soda, chopped coriander leaves, chopped curry leaves and salt. Combine well with your hand. Now add yogurt (little by little) to it and mix well to make a dough. Heat oil in a kadai / wok. Grease your palms and take a small portion of the dough and roll into a ball. 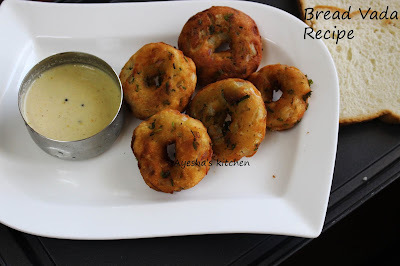 Press lightly and make a hole in the center same like medu vada. Drop it to the hot oil and deep fry until golden and crispy over a medium flame.